We’re a few days into December but it’s never too late to set goals and try to plan out what I would like to get accomplished for the month. But first, I am so excited to show you how I did on my November goal of unpacking a box a day! Awesome, right? 20 boxes. I am so proud of myself! And our basement floors have been refinished so now we can start using that part of our house. Don’t they look great? 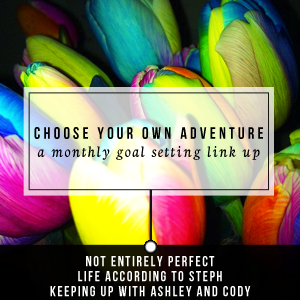 December’s theme for the Choose Your Own Adventure link-up is Simplify. I love this theme. Everything about the Christmas season seems to compel me to do more, more, more. Thus, I am forever trying to keep it simple. A few simple gifts for family members, a few simple holiday activities with the kids, and spending time preparing for Jesus’ birthday and spending time with people who are truly important to me. I could set a million goals related to this theme … isn’t that ironic? … but for me the key is just continually reminding myself that what I am doing is enough. My kids will have a wonderful Christmas even if I don’t make them that handmade Advent calendar I keep thinking about. The store-bought gingerbread house kit is fine. The fact that my house isn’t decorated the way I want it to be really doesn’t matter. Since this goal is kind of squishy and hard to measure, I’m going to try to stay on track by spending at least 5 minutes a day in meditation/prayer on this subject. I have a severe case of monkey mind, so this will be quite a challenge for me. More fun stuff: I was featured in Kathleen’s “Working Mama Files” series here, and don’t forget to enter my Favorite Things giveaway here. Well done, Sarah! I like how you have a calendar to keep yourself accountable. Most of my Chistmases are pretty chill. The only thing we decorate is the tree, and this is the first year we made a gingerbread house even if it was store-bought (I wouldn’t even know how to make it handmade lol). I do have to remind myself though to keep it simple, not get so caught up in the Christmas music or the expectations and just let it be. Congrats on emptying boxes, Sarah! I love that you took a picture of the empty space. I am very interested in your December goal and how it fares for you. I’ve meditated on and off for the last few years, but still struggle with sinking into the quiet. Monkey mind? I can totally relate. Holy crap, you killed it with your unpacking!!! I try really hard to keep the holidays simple. I get overwhelmed easily so simple is better. I see all the stuff on Pinterest and want to do it, too, but then realize it won’t happen and it’s totally fine. Meditating is superhard for me, too. My mind ALWAYS wanders. I’m all about simplifying things these days, too! I don’t meditate – like you I end up making lists and thinking about all the things I need to be doing! The floors look great & good job on all the boxes! Go girl!!! I don’t think I kept up with my exercise goal, but I did go almost 2x/week for 3 weeks. Need to pick it up again! It’s true – they’ll have a wonderful holiday, no matter what. I’ve been trying to calm myself down about not doing EVERYTHING Christmas ever. There’s just too much! The weather is inclement. The kids get cranky. We’re mellowing it out this year. Tamara recently posted…The Most Memorable Photo Shoot I’ve Ever Had. Great job with all those boxes! I love that you are tracking it on a calendar like that, it provides a great visual. I meditate every morning. I have been getting a lot of questions on the topic from all over, not just blog readers. I am going to be working it in to my writing in 2015. I would start by throwing out all your preconceived notions on what meditation is and look at what you want to get out of the experience for yourself. Hey nice work! And your basement floors look awesome. That space will be so nice to have! I have no idea how people survive w/out basement space. Yay for 20 boxes & yes the refinished floors look great! I meditate every morning for 5-10 mins right after I do some yoga stretches and it’s a perfect way to start and set the tone for my day. Holy cow on the box goal, nicely done!! I’ve never tried meditation before. It would probably help, since my mind moves way too fast. Wow! Awesome! And what is that cool calendar with the dots? That might be a great tool for me to use. Every month, I set a goal to get up when I wake up and not lay in bed. Perhaps something visual like this would help me! I feel like I NEED to linkup to this linkup, I need more organization in my life. What a great goal, to simplify during a time traditionally marked by excess! This year I think having a new baby has put things into perspective for me as well. I didn’t have time to agonize over what I was going to get a million people (in the past I suffered from overanalysis paralysis when it came to buying presents), decorating the house “perfectly” (whatever that means), or worrying about entertaining visitors (I trusted that each other’s company would be enough for a good time). I think I want my December to stay simple, and also, insular. I want to be in my little family cocoon and skip the shopping and malls and deals as much as possible. My meditation takes place every morning for 1.5/2 hours (when I am working out) it’s a time to clear my head and calm down about EVERYTHING!